Provided with 2 Main Pockets, 1 Main Internal Compartment and 2 Side Zipper Compartments.Strong and Durable Metal Buckles, Quality Stitched. 100% Naturally Tanned in Sunlight by Vegetable Oil. Perfect for Travel, Journey, Trips, Trekking, etc. 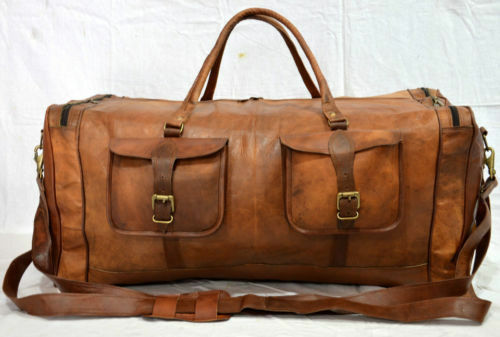 Best suited for to use as a Travel Bag, Duffel Bag, Luggage, etc. Handmade by Skilled and Experienced Artisans with Dedication and Love. "Leather Panache" was established in the year 2001 with the intend to Engage in Manufacturing and Exporting Handmade Vintage Leather Bags including Leather Sling Bags, Leather Handbags, Ladies Handbags, Leather Tote Bags, Leather Backpacks, Leather Travel Bags, Leather Messenger Bags, Leather Laptop Bags, Leather Duffel Bags, Leather Brifecases, Vintage Leather Journals, Leather Notebooks, Leather Journal Cover etc. The Complete Portfolio of the products is a Tasteful Expression of personal style created by our Highly Skilled and Experienced Craftsmen. Creative Designs, Innovative Ideas, and Customer Oriented Approach have been our key focus. Our Company has Defined the Art of Designing and Production Facilities to meet the Ever-Growing Demands of the Burgeoning Market. We have been Exporting across major regions of the globe with Preferential Shipping Rates including USA, Europe, UK, Australia, Canada, Mexico, etc. Each Product by our Company is made by the Grace and Goodwill of our Highly Skilled and Experienced Indian Craftsmen with True Dedication and Love. We are always open to new Creative and Innovative Ideas and we do provide Customization to Great Extends as per the Requirements and Demand. We never Compromise on our Quality under any circumstances. We have been able to gain Goodwill in the market mainly across USA, UK, Europe, Cananda, Mexico, Australia and we believe that the Whole and Sole Credit goes to our dedicated team of Artisans. The Hard Work of our Professionals combined with their ability to grasp has made us deliver Exceptional Services and Products to our Clients. Go ahead confidently because "Leather Panache" knows what it takes to be!